The new face of American terror: white males worried about minorities taking over “their” country. Even as mass shootings in America have become almost a banality, last week’s massacre in Charleston, South Carolina manages to stand out. White supremacist Dylann Roof brought a concealed handgun into an African-American church, issued a series of terrifying proclamations about a race war, and murdered nine people. He intentionally left witnesses so they could repeat his words. Later research uncovered a trove of racism, including a detailed manifesto and pictures of the shooter wearing patches of racist African regimes on his jacket. This behavior falls in line with conservative thinking on a wide range of issues. After Hurricane Sandy, FOX News moved quickly to quell any suspicions that climate change enhanced its devastating power. And after just about every mass shooting, calls for sensibility in our gun laws are met with accusations of politicizing tragedy. It seems when something goes wrong, the last thing conservatives want is to figure out why. Unfortunately, even though this behavior is largely characteristic of the right, it drives the entire nation away from dialogue about real solutions. So in the aftermath of the Charleston shootings, the nation’s focus has shifted not to guns or to race, but to the Confederate flag flying over South Carolina’s capitol building. True enough, that flag is a widely recognized symbol of slavery, racism, treason, hate and violence. It should go. 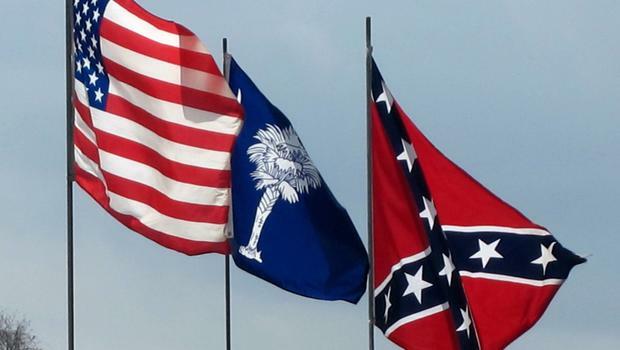 So on Monday, a kind of progress was reached when Governor Nikki Haley finally agreed – after an embarrassing display of conservative hemming and hawing on the issue – with the strong national consensus that wants the flag taken down. The U.S. flag, the South Carolina state flag, and the Confederate Flag all fly over the South Carolina’s capitol building. Removing the flag will purify many hearts and minds. But it’s a politically expedient scapegoat. For all it matters in practical terms, we could adorn our statehouses with swastikas, hammers and sickles, and stars and bars. What’s important is solving the real problems involving flesh and blood. Thrusting symbols into the center of the controversy severely diminishes how seriously we approach issues of guns and race. A real solution might be to enact some basic gun control. But to conservatives, that perceived violation of the 2nd Amendment – a hallowed handful of words, wildly misinterpreted and written 230 years ago – is much too frightening. Better, they say, to have more guns and let everyone shoot each other or learn to live with the occasional tragedy. It’s the price of freedom. 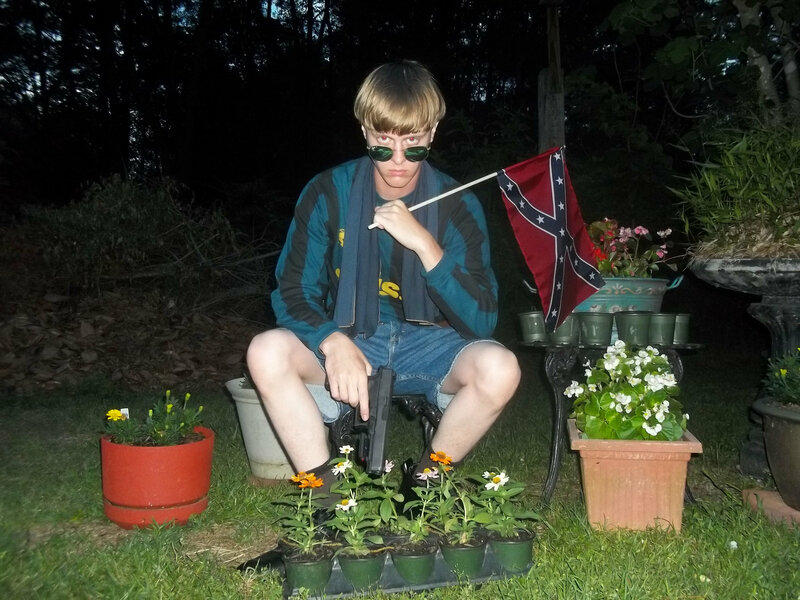 It would be a little unfair to say that Dylann Roof, gun nuts and racists represent the whole conservative movement. But between Roof, the Gabrielle Giffords shooting, racist hate groups donating to Republican politicians, last year’s slayings at Isla Vista by a men’s rights champion whose attitudes toward women are echoed in mainstream conservatism, and the Stone Age barbarism of Republicans like Todd Akin, these are starting to look less and less like disconnected incidents. If conservatives were inclined toward introspection they might see something rotten, manifested by the unsavory company they keep, their persistent denial of reality and a total disregard for the consequences of one’s words and actions. Violence, economic inequality and climate change are arguably the three biggest issues the nation faces. And on every single one, Republicans plug their ears, close their eyes and defer to centuries-old dogma and junk science from the gun and oil lobbies. Climate change is by far mankind’s most pressing global concern. Taking it on offers an exciting opportunity to clean up our environment, improve the quality of life for all the planet’s inhabitants, and provide abundant jobs to overhaul our infrastructure. Yet conservatives tend to be of one of two attitudes: either climate change isn’t happening or it isn’t manmade so there’s no reason to alter our behavior. At the more extreme end of the spectrum, there is perhaps a third opinion that acknowledges it is happening and is manmade but would rather exalt the needs of short-term corporate profit anyway. Wealth inequality has also rightly been identified as a defining challenge of the times. America is dramatically economically stratified. Obvious ideas to rectify this are taxing the wealthy to pay for social needs and empowering workers through unionization. But conservatives become apoplectic at every suggestion that seems even mildly socialistic. In a nation where business runs everything and can get away with just about whatever it wants, conservatives insist the solution is even less public oversight. On all these essential issues – gun violence, climate change and wealth inequality – nothing substantial has been done. Conservatives don’t like the solutions to these problems because they chiefly involve putting a stop to the destructive behavior of their closest allies and supporters. It took the murder of nine innocent people and a nationwide roar just to get conservatives on board with removing the Confederate flag, and even then the denunciations are not especially strong. Imagine how difficult passing real gun reform will be when conservatives can’t even let go of an unapologetically racist symbol without a fight.